Time spent with grandparents is the stuff of both memories and character. The Changing Behavior Network host, Dr. James Sutton, shares one such experience. For a number of years I was the only grandchild on my mother’s side of the family. For that reason, my grandmother and I shared a very special relationship. Hey, when you’re the only grandchild, you get lots of attention. One of my favorite memories about my grandmother goes back to the time when I had spent most of the summer with her and my aunt’s family in Minnesota. I was about nine at the time. After summer vacation, Grandma and I made the return trip to Tulsa, Oklahoma, by train. Those were the days when only the well-to-do could even think of traveling by air. We were well-prepared. Dressed in our Sunday best, and armed with a couple of sacks of books, games, and plenty of snack food, Grandma and I boarded the train and settled into our seats for the two-day trip. I can still remember watching the scenery go by, occasionally drifting in and out of sleep to the steady rhythm of the clickity-clack of steel wheels on steel rails. For those riding through the night in coach (instead of the much more expensive Pullman sleeper cars), the porter would make his way down the aisle renting pillows. We only needed one for me. Grandma, an experienced rail traveler, always carried a big, down pillow with her. In the morning the train made a stop (in St. Louis, as I recall), so Grandma treated me to a hearty breakfast in the station’s cafeteria. When we re-boarded the train, we discovered that the porter had taken up all the pillows, including Grandma’s! Grandma insisted that, since her pillow was so much better than the others (it really was), he would sort through the piles and piles of pillows until he found the fine pillow that belonged to her. He finally brought her a pillow, but it wasn’t THE pillow (something he heard about all the way to Tulsa). Very few folks today can recall traveling by rail through the night. Thinking back, however, I suppose what stands out the most in that experience of traveling by train with my grandmother was that it was a special adventure of just the two of us. I was home on leave from the US Navy when my grandmother passed away in 1968. It was a few days before my scheduled departure for a two-year hitch in Japan (including two assignments with marines in Vietnam). She was very sick, but she knew I was there, that I was still home. To this day, I believe she picked her time to go. Dr. James Sutton is a former educator, a semi-retired psychologist, and the founder and host of The Changing Behavior Network. This story is from the book, GRAND-Stories: 101+ Bridges of Love Joining Grandparents and Grandkids, edited by Ernie Wendell. His name was Colonel Charles Burton Robbins. To me, he was Bompy, my maternal grandfather. I still have memories of a week with him at his summer cabin in the Iowa woods. I was 6. Bompy was a quiet, good-humored, kindly, gray-haired grandfather whose casual ways belied his considerable wisdom and experience. His collection of weapons from the Spanish-American War and World War I was an awesome sight. It made a lasting impression on a young boy. That summer visit was really special because we were alone, just the two of us at his backwoods cabin. The experience took on even greater proportion when, after a bit of begging on my part, Bompy let me ride his horse around the cabin area. He told me to be careful, not to go too far, and not to get lost. But he also gave me some advice in case I did get lost. “Just let go of the reins and the horse will bring you home,” he said. Off I went down the cool and inviting trail. I came to a large, open meadow. After riding around in the meadow, enjoying every minute of my new freedom, I decided it was time to head for home. But, as fate would have it, I couldn’t find the trail. On the fringe of panic, I searched the border of the meadow. I was covered all the way around; trees, trees, and more trees. There was no opening anywhere. I then remembered Bomby’s advice: “Just let go of the reins and the horse will bring you home.” Well, I did … and he did! Dr. Stephen R. Yarnall passed away in 2011. He was a practicing cardiologist in Edmonds, Washington for 50 years. He also was an accomplished speaker and an active member of the National Speakers Association. CLICK HERE for more information about the book, GRAND-Stories: 101+ Bridges of Love Joining Grandparents and Grandkids. I’ve heard it all before; there are so many reasons people feel like they’ll never get organized. Too much stuff, too little time, no energy; the list goes on and on. These are false beliefs. Once we allow ourselves to think about decluttering and organizing as an exercise toward healthier habits, rather than as a difficult project, we can take some positive steps towards enjoying happier, healthier, more productive lives for ourselves and our families. Here’s a list of my five favorite decluttering myths, along with reasons why they aren’t true. Organizing does involve some light manual labor, so those with certain physical challenges may find it a bit more difficult, but really organizing is more of a mental challenge for most. Being open to recognizing the various emotions that your belongings have gathered with them along their journey with you can be difficult for many people. There can be a collection of fear, guilt, shame and apathy associated with clutter; it’s often a challenge to face those emotions head-on. The great news is that these emotions are attached to inanimate objects! These things can’t get angry or sad at your expense. They can’t judge you, either. You, however, can let those useless and damaging emotions go by simply taking them out of your house and over to the donation center, recycling center or dump. Think of it as your own personal therapy session and trust that you can’t do it wrong and you can always go back and make improvements as you see fit. Organizing is about making decisions. What I love about decluttering is that the process lets you learn and practice making good decisions for yourself. Personally, I find it’s actually the safest environment to do so. You get to be in control regarding how you want your home to look. Best of all, there can be no wrong decisions. Whatever you choose will be exactly right, no matter what. It’s just about what you like and need for yourself in your home, and, with some practice, it does become much easier – fun even, because you’re learning how to empower yourself and learning what you like in the process. Overwhelm is the quickest way to stop a healthy habit. In organizing there will be moments where you do feel overwhelmed, but it’s okay. It’s about making one choice at a time, then taking one step at a time to help you take action versus giving in to overwhelm and stopping altogether. When you view your clutter as a whole or your home as one entire project, it may seem extremely challenging to even think about decluttering. However, when you start to break the project down into smaller, more manageable steps, it becomes doable, maybe even kind of easy. So, to start decluttering your house, pick one room to start and pick one category within that room. If you choose your bedroom, start with your wardrobe. Then pick one category within clothing, like jeans. Place all your jeans together and then, one-by-one, go through them, making a decision on each pair as to whether or not to keep them. Trust your instincts and know that the more often you go through your items, the easier it will become to make the right decisions for just about everything in your life. Trust me, if you are low on time and/or energy, you NEED to declutter. This is how you will get more time and energy because you will be letting go of old emotions as well as physical and spiritual clutter. This is an easy way to do a body/mind/spirit cleanse without having to consume or buy anything weird. The less clutter you have, the less time you’ll spend looking for lost items. You’ll also save mental and physical energy because you’re not wandering around looking for lost items. The day after you first learned to walk, did anyone expect you to know how to run a marathon? No, right? Why would you then expect that for yourself? Creating positive change takes a little time. No one does it perfectly right away. It’s about making small decisions that, over time, lead to amazing changes in your life. It’s a process, and you can keep decluttering as you go throughout your entire life, and you can do it as you see fit. There’s no wrong or right way, it’s just about wanting to surround yourself with meaningful people, places and things for a happier, healthier, more productive life. Since positive change doesn’t always happen overnight, it’s important to get used to the process in your own time. By letting go of fear, judgment and what you think the outcome “should” look like, you’ll help yourself overcome obstacles and create the changes more quickly. Long before decluttering expert, writer and speaker, Alison Kero, started her first organizing business in 2004, she searched for ways to make her own life easier. Since implementing her new decluttering system, Alison has found she now enjoys increased energy, improved productivity and overall greater contentment. She truly enjoys teaching this easy, effective system to her clients through her company, ACK Organizing. To reach Alison, go to http://www.ackorganizing.com. Okay, I’ll admit it: I am excited about this! After a couple of months of planning, The Speakers Group is now a reality. I thought starting The Changing Behavior Network five years ago was a great experience, but this one tops it. The Changing Behavior Network announces a new component to the efforts of encouraging and supporting children, teens and their families in what many consider difficult and challenging times: The Speakers Group. The Speakers Group is made up of guest authors/experts that have been interviewed on The Changing Behavior Network. They can provide a number of services for you or your organization, including ARTICLES for your blog or newsletter, INTERVIEWS and BOOK SIGNINGS, CONSULTING (including coaching), PRESENTATIONS, TRAINING and CONFERENCE keynotes or break-outs. These individuals make up a strong collection of resources … so use them! Two things are especially unique about these listings in The Speakers Group. First, each one of them contains a “Listen to an Interview” audio link to an actual Changing Behavior Network interview with that person. This enables you to “sample” their expertise without even leaving the page. And second, since The Speakers Group is a listing and not a booking agent or a speakers bureau, you will be able to communicate directly with each group member or their staff. That’s a BIG benefit. Consider asking one or more of these experts for an article for your blog or newsletter in exchange for a byline about their work, book and website. What better way to start a great relationship? To go straight to The Speakers Group page, CLICK HERE, or use the tab at the top of this page. Father Hunger is a phrase many psychologists, authors and poets use to describe the universal and life-long yearning children have for a father’s love and involvement. Sometimes loving dads satisfy that hunger. Other children continue to yearn when their need is not met by engaged fathers. Some starve for lack of fathering. Ultimately, it’s how close a child feels to their dad that makes all the difference as to how satisfied their hunger. If you’re a dad, that means that your focus ought to be, as much and as often as possible, and as intentionally as you can focus, on creating that feeling of closeness with your kids. May our children never go hungry, as some of us did. Great Dads Shape Great Kids. Be a Great Dad Today. [i]Reported in John Sowers, Fatherless Generation: Redeeming the Story (Grand Rapids, MI: Zondervan, 2010), 36-37. [ii] Cited in Kyle D. Pruett M.D., Fatherneed: Why Father Care Is as Essential as Mother Care for Your Child (New York: Broadway Books, 2000), 38. [iii] Cited in Gail Sheehy, Understanding Men’s Passages: Discovering the New Map of Men’s Lives (New York: Balllantine Books, 1998), 166. Post by Keith Zafren, founder of The Great Dads Project and author of the award-winning book, How to Be a Great Dad—No Matter What Kind of Father You Had. Men who want to be great dads love the stories Keith Zafren tells, the practical skills he teaches, and the personal coaching he offers. Keith has spent seventeen years learning firsthand how to raise three great teenagers and stay close to them, no matter what. He coaches busy dads not to repeat the mistakes their fathers made, but instead, to create fantastic relationships with their kids. Check out his free Great Dad Video Training. National Popcorn Day is celebrated annually today, January 19th. This time-honored treat can be sweet or savory, caramelized, buttered or plain, molded into a candied ball or tossed with nuts and chocolate. However it is enjoyed, enjoy it on National Popcorn Day, January 19th. About the same time, Louise Ruckheim added peanuts and molasses to popcorn to bring Cracker Jack to the world. The national anthem of baseball was born in 1908 when Jack Norworth and Albert Von Tilzer wrote “Take Me out to the Ballgame”. From that point onward, popcorn, specifically Cracker Jack, became forever married to the game. TWO THOUGHTS ON FORGETTING: Difficulty with remembering specific things can be associated with anxiety or worry, or it can be a veiled form of defiant behavior. Most counselors and therapists have dealt with these kinds of issues. Let’s take a look at both types of forgetting. What about the person who leaves for work or an extended trip only to worry later if they closed the garage door, unplugged the curling iron or left the front door unlocked? To some degree, we’ve all been there, right? Kids can experience much the same thing. I recently went to some training on the treatment of anxiety disorders. While there, I picked up a little intervention that makes a lot of sense. It’s based on the fact that added cognitive impression at the moment of “storage” improves memory exponentially. But, of course, nothing changes. In most cases, the youngster will say, “No,” just to end the conversation. Then, if they DO forget, I’ve created an opportunity to remind them what they told me earlier. Since these kids don’t really like to give adults the upper hand at their expense, you just might have a different outcome when you ask the same question (“Do you think that’s something you’ll forget?) next time. NOTE: This post announces a 25:26 minute talk radio interview with Valerie on The Changing Behavior Network [Interview with Valerie J. Lewis Coleman]. With over 20 years of experience in families and relationships, Valerie has given advice on varying stepfamily issues, including Baby-Mamma Drama, defiant children and a really tough one: disapproving in-laws. Also, as an established author in her own right, Valerie encourages and trains new authors through her publishing company, Pen of the Writer. To listen as Dr. Sutton interviews Valerie J. Lewis Coleman, click this [Interview with Valerie J. Lewis Coleman]. The title of this post is an exhortation I distinctly remember coming from my mother. It addresses the subject of finishing what you start. We didn’t have a dishwasher at our house when I was a kid; we all took turns. When it was my turn, it always seemed to me that the dirty dishes were in piles and piles and piles on the sink. 1. Wash the dishes, dry them and put them away. 3. Clean the top of the stove. One day I took a shortcut. The stove looked clean enough to me; I let it go. I cleaned the stove, and I don’t remember cutting the dishes job short again. Now, I’m not suggesting I did everything perfectly after that, but I do believe I managed to capture a pretty decent work ethic. For that, I thank a pair of hard-working parents who lived their integrity every day of their lives. It’s not an automatic thing. If our children are to gain the satisfaction of doing a job well, they have to learn it somewhere. Willingly doing a job right is not only right, it eventually translates into all kinds of success, financial and otherwise. BEHAVIOR AS A WAY TO FIX PROBLEMS: The behaviors of young people, what they DO, can be one of the best indicators of what’s going on inside of them. More often than we realize, their behaviors are an attempt to “fix” issues and situations in their lives. Reading this behavior is not especially difficult, but it does take a little practice. A boy is fearful his parents will divorce. How does he stop them? I’ve seen youngsters find their way into so much trouble at school their parents had to come together to deal with it. Now that’s an interesting dynamic, isn’t it? As long as the boy is in trouble, Mom and Dad are actually communicating and working together on something involving their son. And, as long as they are working together, they are together. With that kind of payoff, how do you propose to stop the lad’s behavior? By way of another example, I once had the opportunity to work with a high-school girl from a single-parent family. (Her mother had died of pancreatic cancer, one enormous and unaddressed source of the girl’s pain and anger.) Dad’s work kept him on the road all the time. The girl shared with me she felt she had lost both of her parents. She found an effective way to get her father off the road: She began failing in school. It worked! Dad had countless meetings with her teachers and he begged her to bring up her grades. Clearly capable of passing, the girl failed the ninth grade. In fact, since Dad was a slow learner, she failed it THREE times. In both of these examples the youngsters considered the consequences of their behavior preferable to letting the problem continue. As obvious as these situations seemed, they were NOT obvious at all to the folks in the middle of them. Effective intervention, therefore, should address the problem the behavior is trying to “fix” (if possible), then addess both it and the behavior. For the past several years, I have held a Sunday School service at a local nursing home. I take my guitar and spend an hour or so singing, playing and visiting with the folks there. It has become an activity that charges my battery for a week. I miss it when I miss it. Recently, I was wrapping up a visit. I opened my guitar case to put it away, but was distracted a moment when one of the residents drew my attention. In the time while my guitar case was open, a stately gentleman rolled his wheelchair up to the case and deposited a dollar into it. Before I even discovered the dollar in my case, he was making it down the hall to his room. For a moment, I considered stopping by his room and giving his dollar back to him. But my second thought was the right one: He WANTED to give it, and it brought him a blessing to do so. I took his dollar back up to the church with me, and I put it in the offering plate. His blessing stayed, and grew, didn’t it? When he was only one day old, Noland was doomed. His mother rejected him. Fortunately, Lurlene took Noland in; she is today raising him with her own family. Touching, right? But the story’s even more touching when you understand that Noland is a pit bull puppy and Lurlene is a mama cat with a litter of her own newborns. So far, they’re all doing just fine at the Cleveland Animal Protection League. The nuruturing and nutrition Lurlene provides Noland are giving him a chance at life. Even his litter mates have accepted him. Although Noland is much larger than any of the kittens, it doesn’t seem to matter. Yes, Lurlene, teach us a few things about acceptance. I explained I had borrowed them from the sheriff. An artist friend was going to make a graphic of them for use in a training program I was doing on codependency. “So you have a key for these, Dad?” he asked. “Yes; I do,” I mumbled as I hit “Save” on what I had been writing. 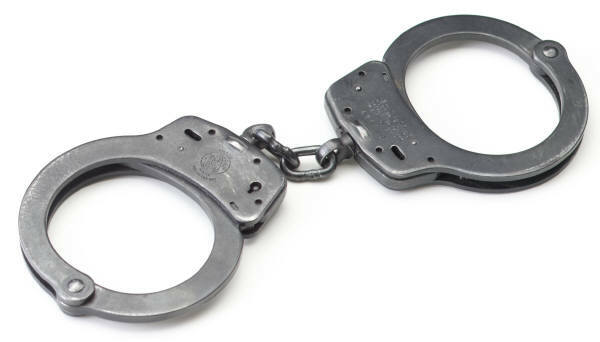 Immediately, he slapped the handcuffs down over both wrists. The boy never blinked. He held out his hand. I dug into my pocket and passed him the key. I’m not suggesting every kid get the feel of a pair of handcuffs. (After all, some risks are better than others.) But here was an example of a reasonably safe and spontaneous venture into risk-taking. If a kid can’t enjoy being a kid, what’s the point in being one? In this handcuff-modeling scenario, my son demonstrated something I would never want to see tarnished: He trusted me absolutely. How valuable is that? How precious is a son’s or daughter’s absolute trust? It’s valuable enough to help a youngster feel a little more secure in a world that’s pretty shaky sometimes. It’s also valuable enough for a child to know that, through all the normal ups and downs of being part of a family, a parent’s intent and desire for his or her well-being rests on solid ground. Isn’t it fortunate we don’t have to be graduates of The School of Perfect Parenting in order to have that kind of trust from our children? But I do recommend you keep that key in your pocket, just in case. A nationally recognized child and adolescent psychologist, author and speaker, Dr. James Sutton is in demand for his expertise on emotionally and behaviorally troubled youngsters, and his skill for sharing it. He the founder and host of The Changing Behavior Network, a popular internet radio program supporting young people and their families, and every month he publishes The Changing Behavior Digest, offering tips on managing difficult children and teens. Both resources (and others) are available at no cost through his website, http://www.DocSpeak.com. YOU BECOME WHAT YOU THINK ABOUT: If you wanted to purchase music in 1956, your options were limited. There were no downloads, CDs, cassettes, Ipods, personal computers or anything like that. You had two choices: phonograph record or reel-to-reel tape. WHEN LOVE RODE ON A DIME: I was always eager to welcome the west Texas summers. School would be out; I could leave my shoes under the bed. One of my dearest summer memories, however, was watching for the mailman to leave something special in our mailbox. It would be a letter from my grandmother in Oklahoma. The letter was always addressed to my mother, but my sister and I were not forgotten. There would be two dimes taped to a card inside Grandma’s letter; one for each of us. These dimes meant one thing: ice cream! If my sister or I heard the ice cream man on the next street over, we’d rush inside to grab our dimes and stand patiently on the curb until he came down our street. If our tastes weren’t too fancy, a dime would be just enough. It was a given that Grandma loved us, but using the US Mail to deliver ice cream in the summer was a creative way to send the message. It was long-distance love, and we experienced it for many years. But something always puzzled me about those dimes. They were ALWAYS brand-new and shiny; uncirculated. Many years later, Mom shared the story how, near the first of the month, Grandma would ride the city bus downtown with her modest check in hand. She would stop by the bank to cash it, always asking for a roll of new dimes. No old dimes for her five grandkids; they had to be NEW ones. Today it’s possible for grandparents to video chat with their grandkids in real time. Cell phones and the internet give instant access anywhere and anytime, and gift cards can buy just about anything a grandchild could possibly want. But that’s just the point, isn’t it? I sometimes wonder if we lavish TOO much on our children and grandchildren. Can expensive gifts cloud a deeper message? Can love be diminished by extravagance? Might we return to a time when the heart of the giver was more valued than the giver? When love sometimes rode on a dime? “I JUST GOT BACK FROM THE MOON!” Before you laugh too much at this one, you must know it actually happened in a counseling session of mine. I asked an 11-year-old how his weekend went. He launched into quite a tale. He told me his folks were divorced and that his father lived outside Houston. When he went to visit his dad over the weekend, they took a trip to the Manned Spacecraft Center. The boy told me they had a rocket there all fueled up and ready to go, so they asked him if he was up for a two-day trip to the moon. He said, “Sure!” and blasted off. There’s a lot I don’t know about NASA and the whole business of space, but I’m pretty sure Houston folks only track flights; they don’t launch ’em. But I sensed that confronting him would be more harmful than productive. Besides, he already knew he didn’t really go to the moon. For 59 other interventions and ways to develop rapport and redirect youngsters effectively, get Dr. Sutton’s book, 60 Ways to Reach a Difficult and Defiant Child. Just one or two of these great ideas can help create more successful outcomes as it reduces your stress and frustration. What is that worth? For more information or to order this book, CLICK HERE. The man is 27-year-old Christopher Webster. For the past six years he has taken part in the “Free Hugs” social movement started by an Australian in 2004. But the really hug-worthy part of the movement is Christopher himself. He has Asperger’s Syndrome, a condition that makes interaction with others quite uncomfortable and difficult. Most of us know full well the best way to deal with things that make us uncomfortable or fearful is to face them head-on. The problem is we just don’t want to do it. “BE PATIENT WITH ME …”: Growing tomatos in south Texas can be a challenge. You have to get most of your harvest in the spring, as the blistering sun will cut them down in July. “This one’s finished,” I said to myself, as I prepared to yank a plant up by the roots and throw it into the compost pile. It was then my fingers, not my eyes, discovered it: a perfectly formed, fist-sized tomato. Fastened near the bottom of the plant, it was green and growing, resting against the picket fence where it had been shielded from my view. “Be patient with me; I can still contribute,” the plant seemed to be saying to me. I left it. Only the Master Gardener has all the answers. “IF YOU WANT SOMETHING DONE … “: As colonial Philadelphia rapidly grew, Ben Franklin saw a problem developing. Streets became busier and more crowded, clogged with pedestrians, horses and carriages. Traffic was bad enough during the day, but at night it was DANGEROUS. People were getting hurt; the streets needed light at night. Franklin pleaded with the city to put out street lamps for the safety of the people. He was told there were no funds for such a project. Lighted streets were a good idea; there just wasn’t any money for it. Being a man of action and considerable influence (except with the city, apparently), Franklin addressed the part of the problem that was in front of HIS home. He commissioned the crafting of a beautiful, ornate post and had it placed at the street in front of his house. He ordered a clean lamp be lit and placed on the post every day at dusk. Folks nearby admired their neighbor’s lamp post so much they did the same in front of their homes. It didn’t take long before streets were safer all over Philadelphia. TURNING DISABILITY INTO DESTINY: Early in my career as a school psychologist, I met a man who had no arms from the elbows down. As I recall, his name was Bob. As an electrician, he was involved in an accident that left him permanently disabled. Bob eventually became the CEO of a very large nonprofit organization dedicated to putting physically disabled folks back into the workplace. When Bob spoke, people listened. His influence and his service to thousands was beyond measure. Young Louis loved to tinker with the tools in the leather shop. His father, a master leather smith, had a strong reputation across the French countryside as a maker of the finest horse tack. One day, Louis was attempting to punch through a piece of tough leather with an awl, a sharply pointed tool. The awl slipped and struck Louis in the eye. The wound became infected, then the infection spread to his other eye, also. The boy quickly became totally blind. He was sent to a school for the blind in Paris. It didn’t take long for his teacher to discover that Louis was quite bright. Although Louis enjoyed learning, he became frustrated with the method used for teaching blind students to read. Heavy sheets of wet paper were placed over wire or wooden cutouts of letters. When the paper dried, students could read the words by feeling the raised parts of the paper. Louis didn’t like this system much. It worked, but it was slow and cumbersome. Books made in this fashion were huge, heavy and hard to handle. And they were expensive to make. Besides, they accounted for reading only. Trying to write using this system was next to impossible. As a young teen struggling to come up with a better way for blind classmates and himself to read and write, Louis heard about a system of night writing that had been developed by a French army captain. It was an alphabetical arrangement of raised dots and dashes pressed into paper. With it, military communication was possible even in total darkness. Louis liked the idea of night writing, but felt that it, also, was too cumbersome to be practical for the blind. So, armed with the very same awl that had blinded him, Louis set out to improve on the captain’s system. He needed to come up with something that was simple, functional, and easy to use in both reading and writing. He developed an alphabet consisting of two narrow columns of up to three raised dots each. These one to six dots in the columns represented a specific letter. Best of all, it could be read instantly with a single touch. His improved system of reading and writing for the blind gained support by the time Louis was fifteen years old. It seemed paradoxical that the same leather worker’s tool that had blinded him played such a role in the ultimate education, literacy and independence of many millions of sight-challenged individuals. His work carries his name to this day. That fifteen year old boy was Louis Braille (1809-1852). Perception is a close relative of belief; it “colors” everything we do … and everything we don’t do. When we perceive we can’t do something, like ride a bike, ice skate, or stand on our head, we essentially affirm that perception regardless of ability or skill. In other words, we simply “talk” ourselves out of that ability. Perception easily overrides reality, although it eventually constructs a reality of its own. The good news is that negative, unproductive and unhealthy perceptions can be changed through the careful and methodical “adjustment” of behavior. The two are linked into a never-ending cycle; perception influences behavior, and behavior influences perception. Want to change one? Well, just work on the other! A middle school coach once shared with me how he taught a student to remain in his seat when students were working on assignments. This boy was in constant motion. He would, on occasion, come completely out of his seat. The coach had an idea. The boy didn’t think such a thing was possible. Staying seated had always been difficult for him at school, at home, at church, everywhere. The coach smiled and left. In a moment he was back with a jump rope and a timer. He folded the jump rope a couple of times and placed it across the boy’s knees. When the timer went off, no one was more surprised than the young man to see the jump rope still across his lap. He grinned at the coach, handed him the jump rope, and reset the timer for ten more minutes. When the timer went off for the second time, the boy was still in his seat. Once the boy was convinced he could remain in his seat, he became certain he could repeat the challenge, even without the jump rope. Have you ever thought you couldn’t do something, only to watch another person do it, perhaps a person of less skill or ability than yourself? Did it ever cause you to think, “Well, if he can do it, I know I can?” That’s behavioral change that grew from a changed perception. It’s a powerful component of all sorts of learning. Why Was the Coach’s “Experiment” Successful? 1. The instruction was simple and doable. The coach designated ten minutes, not two hours. Also, he instructed the boy to simply keep the jump rope on his lap. He didn’t bog the youngster down with multiple directions on how to do it (“Keep your feet on the floor;” “Keep your back straight and your hands on the desk,” “Don’t rock back in your chair;” “Just concentrate;” “Don’t look around the room”). 2. There was a focal point that gave the boy ongoing feedback. He could watch the timer and know precisely where he was in the challenge. Some folks suggest there was another reason why this experiment was successful: the attention, positive belief and affirmation of the coach. It certainly didn’t hurt. In terms of a long-term skill, the success with the jump rope was probably the most important, most useful and most remembered lesson he taught that student. Okay, this example involves a coach, but a parent can accomplish the same thing. In fact, every day parents demonstrate to doubting children what they can accomplish. 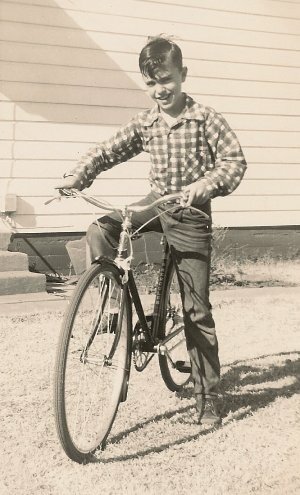 My first bicycle was a full-sized, three-speed English racer; no training wheels. Even with my father walking behind me hold onto the back of the seat, I felt overwhelmed. Knowing he was there with me helped me practice my balance. When Dad thought I was ready to handle the bike on my own, he took me to a part of the street that had a slight downhill grade. I got some speed going and felt pretty good about it, especially knowing my father was right there behind me. Only he wasn’t, of course. When I got to the end of the street and looked for my father, he was half a block behind me, grinning. He had “proven” to me I could manage the bike just fine. From that day on, that bike was my magic carpet over my small part of the world. Is There a Life Lesson Here? If you look back over the scenario with the jump rope, you’ll note the boy did not remain in his seat for ten minutes; he remained in his seat for 20 minutes; his choice! More importantly, he knew he could do the same anywhere and anytime for the rest of his life. While wrapping up a speaking engagement in Sacramento, I boarded a plane for home. I was going to San Antonio, with a stop in San Diego. Jack was in front of me, being wheeled through the jetbridge by an attendant. A young lady, a social worker, accompanied him. He certainly was a delightful fellow and, in conversation with him and the social worker, I discovered he was 104 years old and moving to San Diego. The attendant asked if I would hold boarding the plane until he could come back with the wheelchair; he needed the room to turn the chair around. They seated Jack on the front row, and we resumed boarding. As we were landing in San Diego, a flight attendant announced that Jack was their special guest for that flight, that he was 104 years young, and that he was moving to San Diego. He also shared that, as folks got off the plane, they might want to shake Jack’s hand and wish him the well as as they passed by. As I said, I was a through passenger, so I got to watch everyone as they spoke to Jack before getting off the plane. It was special, indeed. “They are making his day,” I thought to myself. I was wrong, of course. He was making THEIR day! Sometimes I believe my son actually ENJOYS all the negativity his oppositional and defiant behavior brings upon him. Could that possibly be the case? Can a child really “enjoy” being in trouble constantly? If so, what can I do about it? The short answer is, “Absolutely!” Like so many facets of behavior, however, there are deeper issues that play into what’s going on. One huge issue is the power and control a youngster like your son experiences when he can control the emotions and behavior of an adult. Early on in my practice, I had a young patient who had his father by the throat (figuratively speaking, of course). He could make a lot of stuff happen by squeezing on that hold. Unfortunately, Dad played right into the son’s game. All the boy had to do was forget a chore, for instance, and Dad would go into a tirade. Just imagine this picture. All the boy had to do was neglect taking out the trash and he got a first-rate floor show, and he knew he made it happen, and could make it happen any time he wanted. Although the boy didn’t like the hard edge of Dad’s wrath (consequences bordered on abuse), part of him delighted in the power and control he had over the old man. 1. Refuse to become overly upset. If there is a consequence to be applied, apply it, then physically remove yourself from the situation, if you can. Youngsters don’t like consequences. If you hang around, they just might go through their entire script of unhappiness. 2. Work out all the consequences in advance, and write them down. Discuss with your child what would be reasonable consequences for forgotten tasks or inappropriate behaviors. When they are not in a defensive mood or “on-the-spot,” many youngsters will come up with excellent consequences as you consider what would be reasonable and fair for a given situation. (These are called “elicited” consequences. If the youngster helps you with the consequences, he’ll be less likely to say they are unfair when you later have to apply them.) Type all this up on the computer (better yet, let the youngster do it). Go over it again with them, and give them a copy of the signed document. Later, instead of telling them the consequence for a behavior, produce the list, and ask them to read it to you. There’s something about a child or teen stating a consequence in their own voice that takes a lot of the fight out of the situation. 3. Attend to your child when he’s NOT in trouble. Although this makes a lot of sense on the surface, we live in a busy, busy world. When our kids create trouble, we have to attend to it, but it’s easy to let relationships slide when there’s no emergency. Make a commitment just to be with the youngster for a few moments on a regular basis. A parent’s physical presence, especially in those few moments before their child goes to sleep, is a powerful and positive thing. 4. Consider ways to provide additional empowerment. For some kids, getting adults worked up into a full lather appeals to them because they feel that’s the only way they have any power at all. A simple way to increase empowerment is to offer more choices, where appropriate. In assigning chores, for instance, give them five tasks and explain they can give two of them back to you if they do three of them by a certain time. 5. Learn to live more calmly in an imperfect world. This one certainly applies to all of us. I have to work on it every day. As a parent, have you ever had “the-child-you-would-die-for” become “the-kid-you-can’t-live-with?” Even if your experiences were not that extreme, it’s not at all difficult to see how things between parent and child can take an uncomfortable turn. That uncomfortable turn doesn’t happen overnight. In fact, that is precisely the issue, really. The problems we don’t see coming are the toughest ones to fix. Too often, our response is to wait and see if things will improve, or simply do nothing at all (except complain), as we wait not-so-patiently for everyone else to change. Here’s an idea that just might help. Imagine that, starting right now, you had only three days left here on Planet Earth. That’s a 72-hour deadline to settle ALL your business. What’s more, you couldn’t tell anyone you had only three days left. Would this shift your priorities? Would the actions and habits of loved one that used to irritate you suddenly not matter anymore? Would such a challenge move you to take action to do some things that got lost on the back burner labeled “Later”? Obviously, I don’t know what would be on your three-day “To-Do” list; it would be different for every person. But I’m pretty sure what would be at the top of most every list: the repair, revering and deepening of one’s closest relationships. I recently had the opportunity to interview Dr. Frank Barnhill, family practice physician and ADHD expert at his home in South Carolina. The information in this interview is so powerful that I decided to put a link to the intervied on the “It’s About Them” blog. There are over 60 medical, psychological, and environmental conditions and circumstances that can mimic the symptoms of Attention Deficit Hyperactivity Disorder. What does this mean? It means that almost 2.5 million young people are being misdiagnosed, mismedicated, and wrongly labeled as ADHD. The implications of this are far-reaching and harmful to our children. In this fast-paced and fact-filled interview, ADHD expert and family practice physican, Dr. Frank Barnhill, describes the problems and concerns associated with a “quick fix,” a hasty diagnosis of ADHD and use of stimulant drugs without benefit of a thorough evaluation. He shares how a wrongful diagnosis in children and teens can lead to employment, legal, and emotional problems in adulthood. He then draws on his 27 years of family medicine to cover important questions parents should ask their doctor to be sure their children are being effectively evaluated and treated for ADHD (29:04). Dr. Barnhill is the author of the aclaimed book, Mistaken for ADHD. The book, an ADHD blog, and his newsletter, “Living with ADHD,” are all available through his excellent and informative website, www.mistakenforadhd.com. I roll my chair up and down the aisles as I check papers. It puts me on the same level with the students, and it helps foster a team atmosphere.